Considerable debate has taken place over the last several decades over the appropriate way to manage the expansion (or sprawl) of urban areas. Driving this debate are concerns surrounding the loss of agricultural land to urban uses (Kline and Alig, 1999; Statistics Canada, 2006) and the recognition of problems such as traffic congestion, deteriorating air quality, and economic polarization associated with the spread of suburbs that depend on mobility by automobile. One of the primary but most contested approaches to managing urban expansion in North America is the creation of urban growth boundaries. While growth boundaries have been used in the United States for decades by state governments to regulate urban development (Caruthers, 2002), they are much less common in Canada. The Greenbelt, established in 2005 within the Greater Golden Horseshoe, is an example of a Canadian growth boundary. The success of growth boundaries can depend on political, economic, and structural or design considerations, whereby the structural elements may be the outcome of political and economic forces and actions. Structural considerations include (1) the shape, size, and configuration of the boundary and (2) the organization of land uses and transportation systems within and beyond the boundary. Development within growth boundaries is often directed toward transportation corridors or designated urban growth centres (see Filion, 2001, 2007). Growth boundaries are controversial because of their effects on development. These effects can include increases in the prices of commercial and residential real estate (Phillips and Goodstein, 2000; Gibson and Abbott, 2002), the "leapfrogging" of development into the exurban spaces beyond the boundary (Heim, 2001; Caruthers, 2002), or the "leaking" of development into grandfathered lots or spaces deemed to have little value for agriculture or other uses (Porter, 1997). Within the boundaries, researchers have questioned whether growth and development will occur as planned in nodes and along transport corridors (Filion, 2007). The retail patterns and trends we have described raise the question of how large-format retailers will respond to potential rises in land prices in the space between the urbanized area of the Greater Golden Horseshoe and the Greenbelt (Figure 10). Several scenarios are conceivable. For example, retail "leapfrogging" could occur, either leading or following residential development. 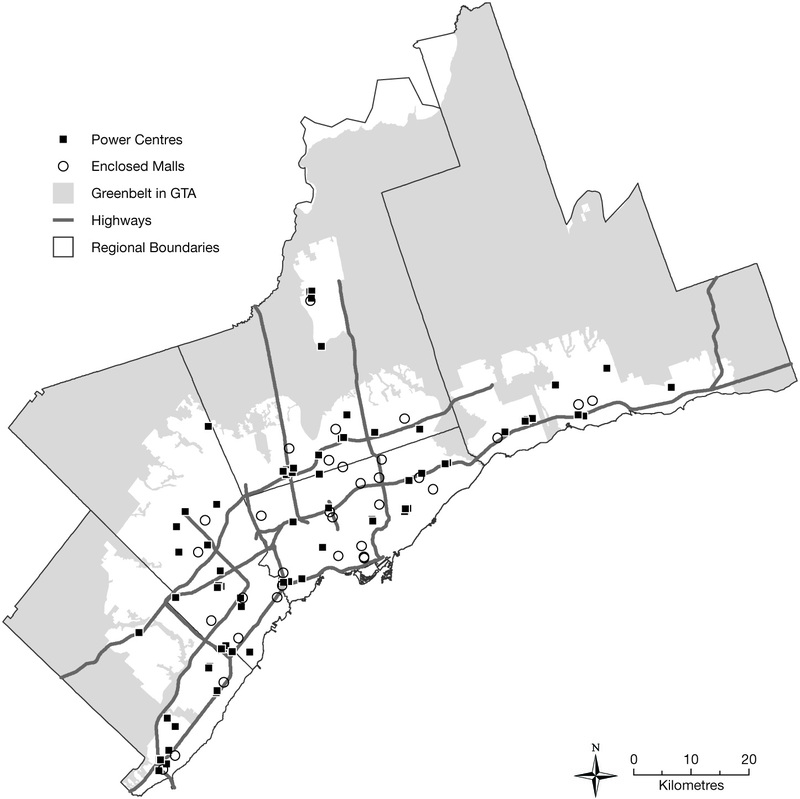 Figure 11 indicates the share of power centres and enclosed regional and super-regional malls within 25 kilometres of the Greenbelt for 1996 and 2005.7 Since the Greenbelt was only recently established (2005), these data provide additional insight into retail centralization and decentralization within the GTA. 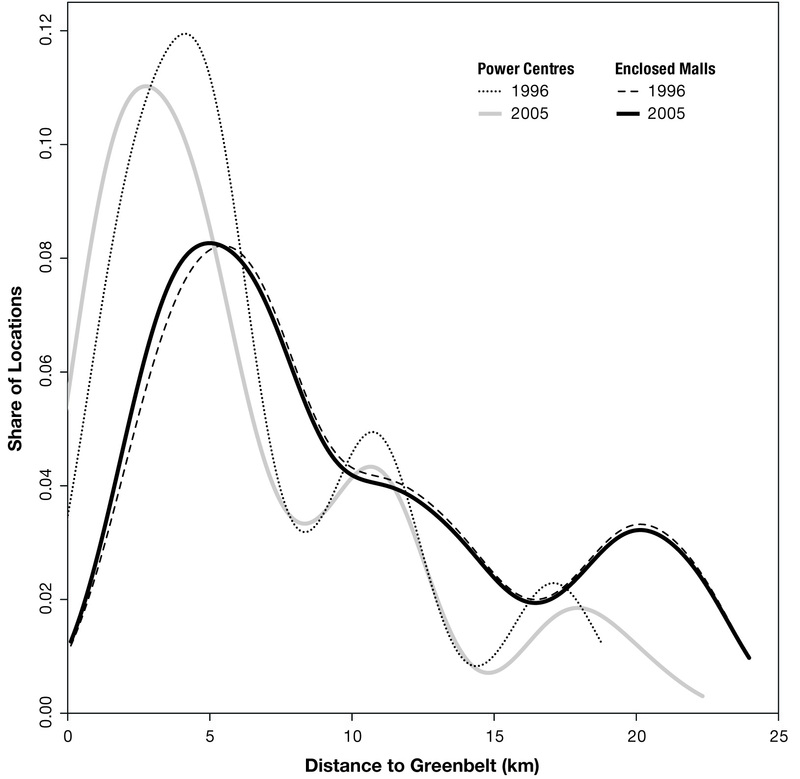 The change in the slope of the curve representing power centres between 1996 and 2005 within the 0-to-5-kilometre range signifies an increase in the share of power centres located close to the Greenbelt, at the outer edge of the urbanized area. The overall decline in the share of power centres away from the Greenbelt also reflects the clear suburban focus of power centre retailing. The marginal shift in the peak of the enclosed mall curve toward the Greenbelt in 2005 indicates the recent construction of Vaughan Mills. Moreover, the peaks for enclosed malls are not the same as those for power retail, since the two kinds of shopping formats occupy different spaces and compete within the regional -market. 7. The figure can be interpreted as a "smooth" histogram. The peaks and valleys in the lines indicate distances from the Greenbelt at which there are a larger or smaller number of retail locations in relation to the total number of retail locations in the study area for each time period. Distance to the Greenbelt is measured as the straight-line distance between each retail location and the nearest point on the Greenbelt boundary. 8. Further expansion of big-box capacity north of Lakeshore Boulevard in Leslieville, however, has been heavily contested recently (see nobigbox.ca; Rusk, 2008). Citing the city's designation of the Leslieville site as industrial use or employment lands, the Ontario Municipal Board in March 2009 ended a five-year-long debate by ruling against the proposed development of a 600,000-sq.-ft. retail space with 1,800 parking spaces.